The article presents an implementation of a teaching tool for handicapped children. Emphasis is on easy and intuitive handling of the various controls. The multimedia application is developed in Macromedia Director. The modules of the program are described and example screenshots are given. 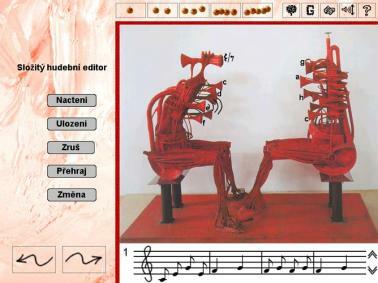 The goal of this work is to create a multimedia application for teaching visual art. The project deals with teaching visual art in kindergartens and primary stage of elementary school with specialisation for physically handicapped children. The work is trying to present visual art to the children in an entertaining way and to make them familiar with modern computter technology. The age of users was taken into consideration, because this program may be the first computer application the child could have seen. That is why the emphasis on simple control was taken into focus, so the choice of right graphics symbols (icons, bitmaps) is very important and text dialogs are supplemented by vocals. This application is developed in Macromedia Director (development kit for multimedia). Director supports different multimedia elements as picture formats (jpg, gif, bmp, psp, tga, etc. ), movies (shockwave, flash, gif, avi, mov, mpg, etc. ), sounds (wav) and other own formats. Applications are programmed by built-in Director�s multimedia operations and scripting programming language - Lingo  . The project was produced as a co-operation between the Faculty of Information Technology (VUT Brno) and Pedagogic Faculty of Masaryk University. The program is structured into several separate modules, which are created in Macromedia Director environment. Modules are inter-connected and share global variables. The advantage of this solution lies in possibility to develop every module separately. The modules are then integrated into application. Such concept is supported within the Director. Project includes one special module root, several main modules and several auxiliary modules. The connection between main module and auxiliary modules is shown for module Nepra�. Nepra� is the only module, which is using all auxiliary modules and that, is why it is the best module for presentation of communication within application (Fig. 2-2). Project is designed and implemented with consideration to availability and usability on a majority of today�s PCs with operating system Windows 9x, Windows NT, Windows 2000 and Windows XP. � Intel processor Pentium (133MHz) or compatible. The size of active area of application is 800 x 600 pixels. Module Magic Tree is used at the start of the application. Its function is the initialisation of global variables. Module Tree directly follows module Magic Tree. It�s a �crossroad� of modules visually shown as a tree with four apples. Each apple represents a certain main module. The picture of module Tree can be seen in Fig.3-1. The task of this module is to teach children the foundation of theory of colour and theory of musical teaching . Children may change the colour of robots in the creation by Karel Nepra� (�Velk� dialog�). Following part of module is dedicated to musical teaching. 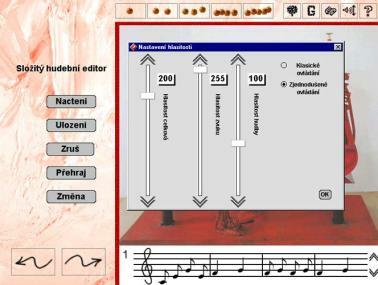 Users can play a simple piano and two music editors. First editor is simplified � it does not force the user to follow certain musical rules. User can save their creations into the Gallery. The picture of module Nepra� can be seen in Fig.3-2. This module uses all auxiliary modules (Setting, Help, Loading and Data). Auxiliary modules are called as modal dialogs. The picture of module Setting can be seen in Fig.3-3. The task of this module is to teach users the composition of a picture. Users may change colour of mosaic (by Jan Koblasa: Cyklus K), add new elements and save their creations to the Gallery. There are two different modes of control in this module: Normal mode uses standard drag&drop control, and in simplified mode, unlike as in the normal mode, it is not necessary to hold down the mouse button during drag&drop operation. The picture of module Koblasa can be seen in Fig.3-4. 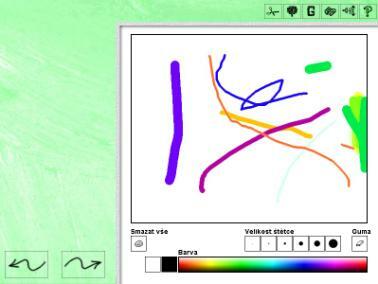 Children can draw simple pictures. They can change colour and pen width. Their creations can be cut out and put into the Gallery. 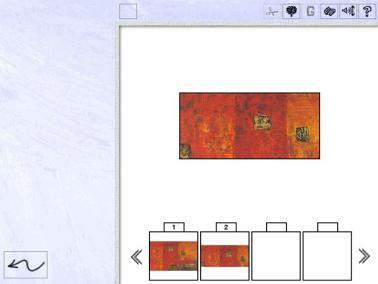 The picture of module Painting can be seen in Fig.3-5. It is a dictionary of complicated words from dialogs in the application. Words and their meanings are placed into an external text-file. Users can store their creations in this module. 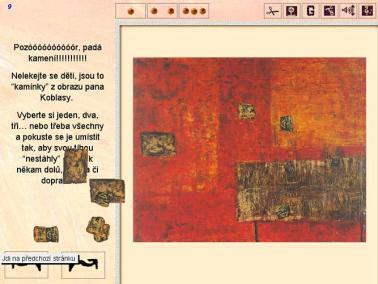 Two different types of elements can be put into the Gallery (graphic pictures from modules Koblasa and Painting and songs from module Nepra�). Parts of the work can be stored into clipboard using the print screen function. From clipboard there are moved into the Gallery. Sounds are stored as list of notes. The picture of module Nepra� can be seen in Fig.3-6. Completed CD-ROM is going to be used as teaching tool at elementary school with specialisation for handicapped children. The application has not been completed yet (voice dialogs, commands, music support are not finished yet, also the graphics design of the application and final beta testing are not completed). Preliminary version was tested on handicapped children, their reactions were positive, that is why I hope this work is going to be useful as a teaching tool. The project will be finished as my diploma thesis. I would like to thank Martin Dob��k and Andrea Dob��kov�, Ph.D. for their help and assistance.